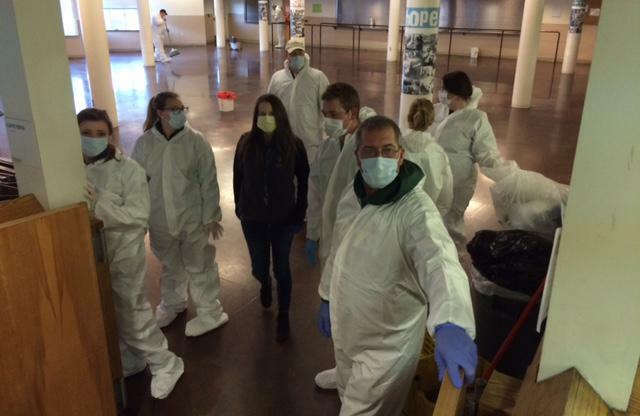 As the weather chills and costs mount, House of Charity managers aimed Wednesday to finish disinfecting the homeless shelter at the corner of Pacific Avenue and State Street on the eastern edge of downtown. Half of the shelter’s employees became ill, requiring the help of community volunteers, said Rob McCann, executive director of Catholic Charities. The giant tents and equipment that were set up on the street outside the shelter to house uninfected homeless people have cost about $10,000 so far. They were set up with cots, food, water and toilets for clients while infected people were quarantined inside the main building. On Wednesday, cleaning crews using a bleach solution were trying to finishing disinfecting all but the top floor of the main building, where about four dozen infected clients remain. The cleaning effort included washing floors, walls and railings, and everything from linens to salt shakers, dishes and coffee pots. Norovirus is highly contagious and causes diarrhea and vomiting. Another outbreak made people at the Union Gospel Mission ill. The virus is commonly spread in close quarters such as cruise ships and nursing homes. McCann said the norovirus outbreak has cost the nonprofit about $20,000 so far, prompting a request for donors. Bouten Construction was among the first to help with a $5,000 donation. If the cleaning effort is successful, the shelter will be able to resume the distribution of mail. Staff hand out 54,000 pieces of mail each year to homeless people. Those letters may include checks such as veterans benefits and Social Security income. “We serve some of the most fragile and vulnerable people in our community,” McCann said. Assistant Spokane Fire Chief Brian Schaeffer said the five-day outbreak brought out the best in Spokane. The outbreak came weeks after the House of Charity opened its doors as an expanded overnight shelter, offering an overflow sleeping area for men and women downstairs. About 210 people stayed at the shelter the night before the outbreak. Published: Nov. 16, 2016, 6:09 p.m.